Hard Knox Bikes is a specialty bike shop offering hands-on workshops for the not-so- average rider. Services and resources support all those who identify as women, people of color, trans and all other gender rebels and allies, throughout the East Bay, Ca. 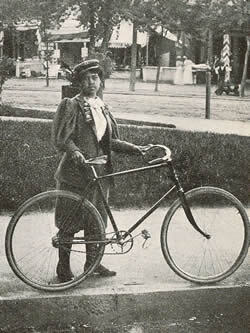 Inspired by Kitty Knox, who in 1895 challenged both race and gender roles in the cycling community, we strive to offer a welcoming space for the diverse communities of folks who ride bikes in the East Bay. Our goal is to help provide equity through representation within the bicycling industry and inspire others to reach out and educated themselves about their bicycles. Offering resources and access to bike mechanic information, materials and hands-on instruction for women, people of color and gender rebels is what we do! By means of hands-on mechanical instruction and safety education, we offer marginalized communities a safe space to learn about their bicycles. We aim to help usher in more knowledgeable bike riders who ride confidently knowing they can spot and handle minor issues and know when to see a professional. Bikes don’t have a ‘Check Engine’ light. With more riders capable of identifying potential mechanical issues before they hit the road, everyone rides safer in the urban metropolis with fewer avoidable accidents. Hard Knox Bikes offers hands-on mechanic workshops and clinics as well as many other resources. For more information on Kitty Knox please check out these links at the bottom of the page. Growing up in the East Bay, Brown began riding her bicycle for transportation as an adult living in West Oakland. The idea to create a women-focused auto business shifted when she realized how much she was utilizing her bike and how much more she could do with it. She has a love for teaching others how to repair their own bikes, and specializes in bicycles from the 1970s through 1990s. She has instructed over dozens of educational and mechanical workshops at Bay Area events and local bike shops since 2010, many for marginalized communities. Through Hard Knox Bikes, the goal is to provide support and resources to marginalized communities that can be overlooked in the larger cycling industry. Brown hopes help create a safe space for women, people of color, queer and transgender persons to gain bicycle education in a welcoming environment. Hard Knox aims to be a resource for more people to benefit from the growing bicycling infrastructure in the Bay Area, while offering representation and inclusion for a more vibrant and multifaceted cycling world. Brown has received certification in Bicycle Mechanics through the United Bicycle Institute and certification in bicycle safety instruction through the League of American Bicyclists #5443. She is also a member of the Professional Bicycle Mechanics Association. To learn more about the Women and People of Color League of American Bicyclist Instructor Training click here. Check out articles featuring Brown and interviews HERE.